Amazon’s Echo has parental controls, and parents would be wise to use them. 6-year-old Brooke Neitzel innocently asked Alexa "Order me a doll house and some cookies.” Alexa did, and soon enough a $170 doll house and four pounds of sugar cookies arrived at her home. It gets more hilarious. When a TV station aired the story about a kid ordering a doll house using Alexa, people who also had Amazon Echo units discovered that Alexa heard the TV report and ordered THEM a doll house, too! Later this year, Ford will integrate Amazon Alexa in some of its cars, allowing drivers to start their engines remotely, among other things. But remember that some cities impose stiff fines for leaving running vehicles unattended. "Alexa, start my car, but watch out for the police!" Aristotle is Mattel’s version of a voice-controlled assistant for kids. The toy company says it’s much more difficult to do voice-recognition with children, especially toddlers, whose verbal skills are constantly and rapidly changing. That’s why Aristotle will cost $300. "Aristotle, tell Alexa to order me a doll house." Two Google Home devices (also voice-controlled gadgets) are arguing with each other, debating questions like, “Are we human?” and which device loves the other more. The bots seem to be offline at the moment, but you can see a 6-hour clip of their conversation here. Was it a faulty GPS, or just extreme car-pooling? A woman in Apex, North Carolina accidentally drove her SUV through the back wall of the garage, over the deck, and into the family's backyard swimming pool. 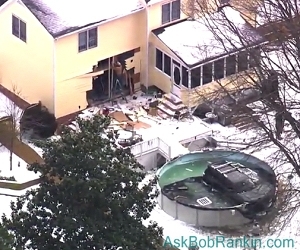 Incredibly, the freestanding round pool was not damaged, but the SUV's transmission was flooded. At CES 2017, T-mobile killed its popular “Simple Choice” plans and replaced them with “All-In.” Henceforth, T-mobile will only sell T-mobile One, its truly unlimited voice, text, and data plans; $70/month for a single line, $160 for four lines. The prices include any taxes and fees. This just in from the "Some Publicity Really is Bad Publicity Department" -- Verizon told a volunteer fire department it would cost $73,000 to move the phone company’s lines to a new building. T-mobile CEO John Legere thinks that’s “ridiculous” and has offered to pay the tab himself. Fisher-Price will launch an exercise bike for toddlers that includes a tablet holder. That’s just wrong on several levels. The new Proof smart wristband tells you how drunk you are by measuring the alcohol content of your sweat. It even tells you when you’ll be sober again. Powervision is known for airborne drones. Its latest product is PowerRay, a submersible drone that gives anglers eyes and other sensors beneath the waters. And this fishing buddy won’t drink your last beer. The USDA is conducting a pilot program that allows food stamp recipients to buy groceries online from a handful of supermarkets, including Amazon Fresh. Delivery fees and ineligible items would be have to be paid for with debit cards. Please, just don't kill the doggie! Hasbro is replacing two of the game pieces in Monopoly, and you can vote for your favorite replacements online. Options include emojis, a cellphone, and other modern sigils. Most recent comments on "Geekly Update - 05 January 2017"